Photographed by Robert Shantz at Carlisle Canyon, Grant County, New Mexico, June 5, 2007 pollinating a Cane Cholla -- Cylindropuntia spinosior. 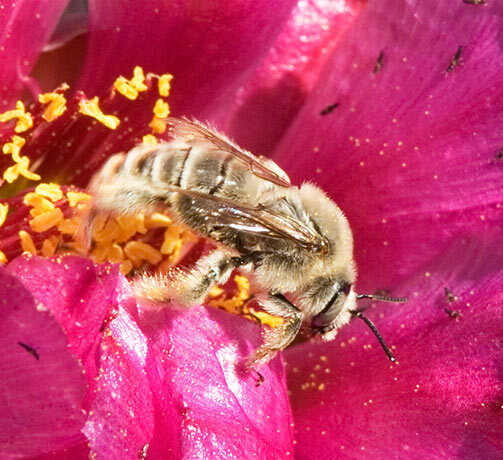 Cactus Bees, as the name implies, favor the flowers of cacti. They alight first on the flared, over-size, green stigma that is borne above the stamens - thus depositing some grains of pollen from the last visited flower. Finally they push down through the forest of stamens to get at the nectar deep inside. Their hairy bodies gather more pollen and their long tongues lap the nectar. Both are carted back to their nests in the ground which they build and provision solitarily, i.e. they do not live in hives.